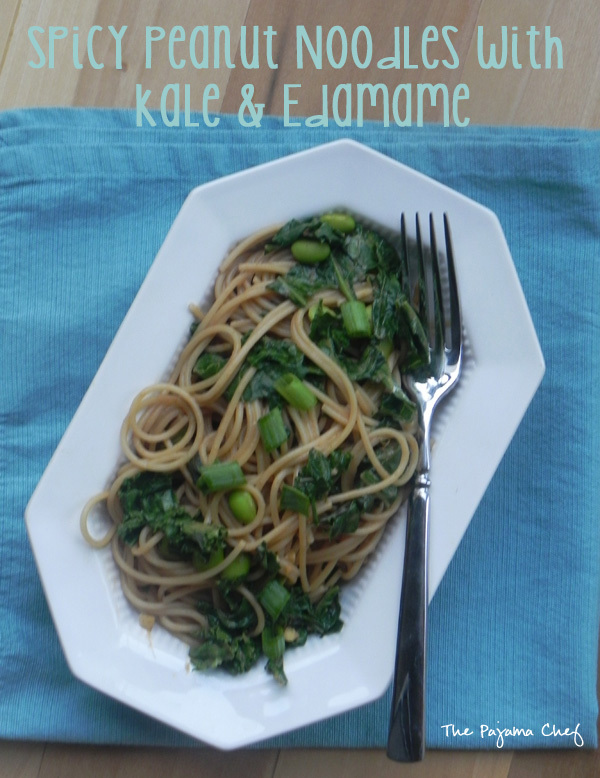 Spicy peanut sauce, noodles, kale, and edamame meet in an addictive, easy pseudo-takeout meal that can be enjoyed hot or cold–what’s not to love?! This spring/summer Ben and I have been eating sesame or peanut noodles all. the. time. [Side note: is there an actual difference between them? I’m sure there is. The librarian part of me is itching to google this up and see what I find out, but I’ll restrain myself.] They have replaced our easy mac & cheese from a box dinners. I have a hard time telling you what recipe I’ve used because a) I have many pinned on Pinterest and b) don’t really measure ingredients for sauces like this because I’ve never taken the time to take a few pictures to share the recipe here! But this time I did. Measure and photograph. 🙂 And this time I didn’t use any recipe except what sounded/looked/tasted good to me. It’s a good thing I did, because my noodles were utterly amazing. Ben walked in the door just as I was mixing everything together and was like, “what in the world is that fabulous smell?! You must be the best wife ever for cooking such an incredible dinner.” Okay, maybe his words didn’t come out exactly like that, but the sentiment was there. I know it. But seriously–these noodles DO smell fabulous. The sauce is the perfect balance of spicy, sweet, and fresh flavors. I used ground ginger in the sauce but if I had had fresh ginger… oh man. Use that if you can. 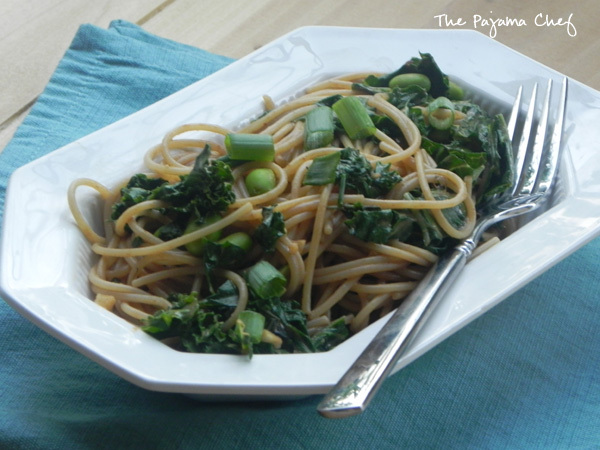 Though I served these noodles as a vegetarian main course, this is a great base recipe to add some meat. I think grilled chicken or thinly sliced steak would be great. Or even shrimp or tofu. This could even be a side dish if you like. We loved every last one of these yummy noodles, and like all good Asian-ish recipes…you can enjoy them hot or cold. They’re great both ways. In the recipe below I included notes about how to prepare them to be more picnic friendly, but no matter how you make them, I’m sure you’ll love ’em! Enjoy! Prepare noodles according to package directions. Be sure to reserve about half a cup of pasta’s cooking water to thin the sauce. While noodles are cooking, whisk together all ingredients for sauce except for the pasta water. When pasta is ready, drain, and return to pot [or a large bowl]. Add kale, basil, and edamame and toss. Thin dressing with 3 tablespoons of pasta water, whisk, and the pour over noodles and vegetables. Toss well to coat. If necessary, add additional pasta water to thin sauce further, up to a full half cup. Serve noodles with green onions for garnish. Can be enjoyed warm or cold, but the dressing does really absorb into the noodles after refrigeration [which doesn’t bother me but does affect presentation] so if you’re making these noodles for an event and want to serve them cold, be sure to rinse well after draining to get rid of starch, toss with a bit of sesame oil, and then refrigerate separately from the sauce and veggies. Toss together before serving. I haven’t tried this technique with this recipe, but I have done similar things for other dishes so I assume it’d work well! Using rice noodles [that you don’t boil to cook, thus, they stay cold] might be a good option too. This looks delicious. We have a Thai peanut chicken recipe we make as well that I am crazy about as well. Yum. My peanut noodles tend to be more peanut sauce than anything. I am such a lover of the peanut sauce. 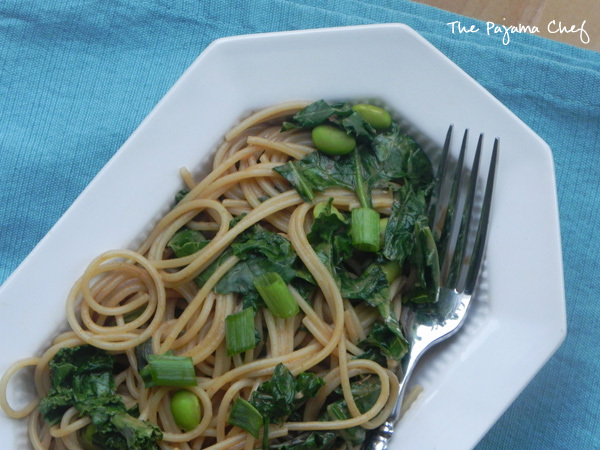 i suppose you saw my ode to peanut noodles this week? We are sO ON THE SAME WAVELENGTH. Trying this recipe next! umm, yes, i did! i had my post all scheduled then saw yours and was like, whoa. two good versions 🙂 love it!! !